Today we have another giveaway from Unique Babeez. We are nearing the end now - have you had fun? Products from Unique Babeez are designed with the busy lifestyles of today in mind and all handmade in Australia by a Work At Home Mum. Offering Modern Cloth Nappying products, Toilet Training Accessories, and a variety of other mum and bub goodies from feeding to playtime. 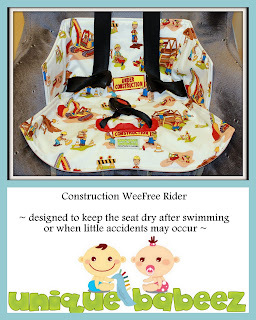 Features: A Construction Wee-Free Rider valued at $35 plus postage. 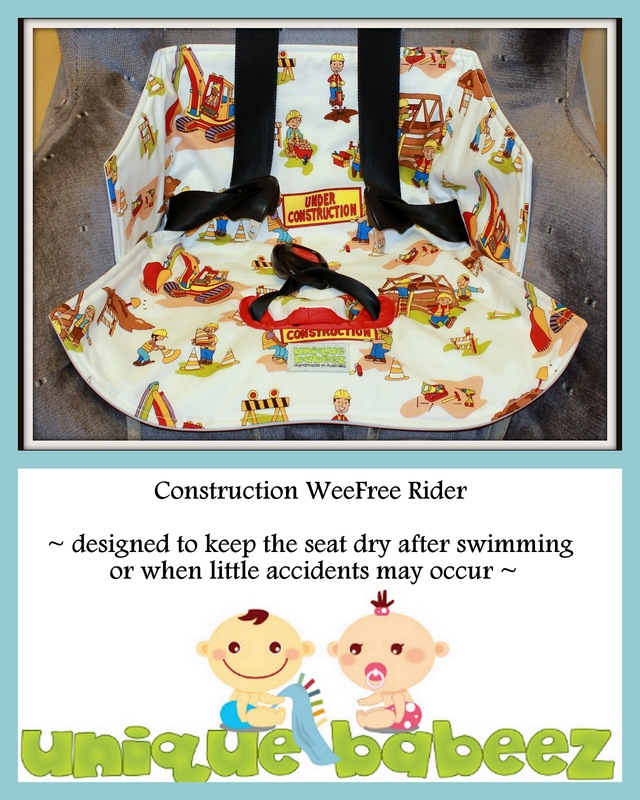 The Wee-Free Rider is waterproof and absorbent and designed to "lock into place" around the features of your car seat. It is easy to remove with one hand, perfect for when you have a wet child in the other arm or an arm full of bags and things. It is a semi-universal design to also fit most prams and strollers and is machine washable and dryer safe, so even on wet days you get it washed and back into use. It also has a specially designed tongue to save the seat from little accidents or after swimming trips. Wow they thought of everything! This would be PERFECT for Thomas now he is in jocks :) - save the booster seat from long drive accidents! Would love to try one of these with bub #3, if only I had one when Mr3 was TTing! My 2nd daughter was the easiest to TT- just before 2 she started going to the potty all on her own- then we accidentally left her nappy off at night and she was night trained just like that! No effort. My son who is 3 is another story however. We have to constantly remind him to go, and even then he still wees his pants regularly. He flatly refuses to poo in the toilet. It's an exercise in patience! No TT stories yet, Though hoping Mr25months might be ready to start this summer. We live so close to the beach too, these will be awesome. At home my son likes to wee on the grass, but when we are down at the shops he will ask to wee on the grass and i say no we have to go to the toilet, normally he is fine with it but one day we were in kmart garden section and i turned around to him weeing in a pot plant. I was so embarressed. I had an easy time with my toddler by just rewarding her with one lolly for a wee and 2 lollies for a poo! Of course sitting with her in the toilet helps because they just love to imitate everything you do! Not so much a toilet training story as my girls practically did it themselves - but when my 3rd daughter was learning to go she also 'taught' her doll and I would often find the doll sitting on the little toilet seat or the potty. After a very trying day of toilet training with my second son, I put him back in a nappy while I was making last minute preparations for a dinner party for 15. He was truly trying to be helpful when he did use the toilet for a number 2, and tried to flush it with the nappy and blocked the toilet ... 10 minutes before guests arrived! While I was shopping for bathroom fittings with my sister my nephew - who had just been toilet trained, came to us and said 'there's no toilet paper' He had used the display toilet in the front window for number twos!!!! Wees were a breeze - my daughter got the hang of it in 2 days and never had an accident. Poos however took a further 10 months and were the source of great frustration for all of us. Moral of the story is everything comes in their own time. My best toilet training story would have to be taking my 2 year old on a 14 hour drive to visit his grandparents, not long after starting toilet training, and not having a single accident on the way :) We're about to repeat the trip for xmas and hoping he's just as good this time!